I've been meaning to do this blog post but such a long time and share with you all my top ten beauty hacks ever! Some of these I learnt from family and friends, some of them I learnt from online guru's etc. Please let me know if any of these work for you or what your beauty hacks are? Beauty Hack Tip One. Pamper yourself with a pedicure using a DIY ex-foliation. Mix granulated sugar and a thick moisturiser to remove rough spots from dry feet. Beauty Hack Tip Two. Cleanse your skin in the morning and again at night in order to allow your skin to breathe and to take off any make-up, impurities or dirt. Beauty Hack Tip Three. Chickpeas are an easy protein and fiber boost. They’re rich in zinc, copper, folic acid, + B6 — great for hair and skin. Beauty Hack Tip Four. 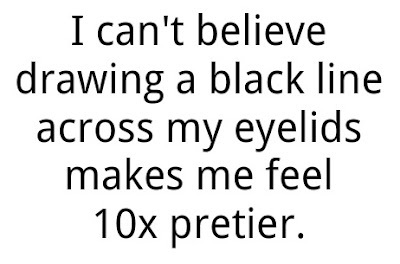 Black mascara looks great on everyone, as it will not only help define your eyes, but it will also make them appear wider and brighter. Beauty Hack Tip Five. Remember to remove your make up before you go to sleep, as you will then allow your skin to breath and prevent your pores from clogging up. Beauty Hack Tip Six. If you want to use a dark eye shadow apply it before the rest of your make up, as you can then wipe away any fallout! Beauty Hack Tip Seven. Blot your lips after applying your lip stick, in order to hold the colour for longer - as you should only need to touch up your lip gloss. Beauty Hack Tip Eight. If you normally use face wipes, start giving yourself a mini facial once a week. They’re simple, easy and don’t take very long to do. Trust me your skin and you will feel so much better. Beauty Hack Tip Nine. For smooth, soft lips, take a clean damp wash cloth and gently rub lips for 60 seconds before applying lipstick. Beauty Hack Tip Ten. Don’t want to splurge on oil blotting sheets? Take a thin toilet - paper square and use it to blot excess oil on your t-zone. Please share any beauty hacks and tips which you have with me? This is a great post! I am always forgetting to take my make up off before bed and then I always wake up with my face feeling horrible! I love this post; I use most of these tips and tricks myself! I definitely agree with the damp washcloth to exfoliate lips; I find that those exfoliators you can buy are too harsh on my lips and actually hurt! It's a great, cheaper alternative! I had no idea that blotting your lips before applying lipstick helped it stay on longer! I also love doing mini-facials, especially when I'm in the bath, I always feel rejuventated afterwards! Thanks for sharing your hacks with us! If I go on a night-out I never take my make-up off and my faces hates me the next morning, I always break out so bad!! Love the softer lip hack, I need to use that!! I have never used blotting sheets but using toilet paper is such a good idea!! !